Mines and industrial sites are becoming increasingly more networked. Emerging safety requirements in the US and internationally, demand real-time wireless communications for voice, real time M2M communications and data. Process control and other operations are increasingly monitored by hand-held data devices and/or centralized IP video. These new networking applications create expectations of high performance over many wireless "hops" (node to node relays), with dependable support for video, voice, and data. Remote Video Monitoring of Longwall Shearers. With this increased focus on safety in underground coal mines, efforts are being made to reduce risks to miners in any way possible. In "Longwall" mining the mine roof is expected to fall when operations are concluded. For this reason, roof supports are not as extensive at the working mine face. This holds obvious danger to the miners operating at the mine face using the mining machines called "shearers". One way to reduce this risk is to remove the miners from the immediate area as much as one mile. But to efficiently operate the shearer, the miner must still be able to see the coal face, a problem from a mile away. One option was putting full motion high resolution video cameras on both working ends of the shearer (the shearer operates both forward and backward). Because of the nature of the mining process, there cannot be any meaningful delay in the image from the video camera to the machine operator. This demands minimal delay and jitter for the video connection. Third Generation MD4000 Mesh nodes are supporting the operation of monitoring precision heavy mining machinery remotely, providing connectivity for high quality video over the multiple hops necessary to ensure that miners are removed to a safe operating zone. Operators are able to observe the operation and performance of the machine, adjusting controls as necessary without exposing themselves to the dangers of the immediate area being mined. The MD4000 network provides a consistent throughputwith a 5.8 GHz backhaul, more than enough to support the two 15fps video cameras with PTZ controls. Delays through each MD4000 node are only 1-2 milliseconds, providing the real-time video necessary for successful remote operation. Because of the dynamic nature of the typical Longwall mining operation, the mine itself is constantly being reconfigured. As the mine face moves forward, sections of the mine are allowed to collapse and new areas are opened. As part of this deployment, it was demonstrated the MD4000 network instantaneously and automatically adapts to the changing environments. MD4000 nodes may be redeployed to new areas of the mine as these are opened, joining the existing network to provide coverage for the video application. No complex network engineering is required. With this network in place to provide remote operation of the Longwall shearer, it is also possible to extend the network to the surface and connect it to the PBX/phone system and other data and voice network. This could ease the maintenance and support of the mining machinery by allowing real-time phone support at the site of the operators and/or equipment as well as to allow access to on-line technical documentation from underground. Successful "Room and Pillar" demonstrating effective VOIP communications and real time asset tracking. In multiple successful demonstrations, working "room and pillar" mines required long distance connectivity for voice, location tracking, and video process monitoring. Because the headquarters and processing plant is some distance from the main entry to the mine, multiple hops were needed both outside and inside the mine, a total distance of 3� miles. MD4458 nodes are installed in a number of locations within the mine itself, secured to the roof or supporting timbers as appropriate for each location and powered by a battery back-up system. Voice connectivity is provided from wireless Wi-Fi Voice-over-IP (VoIP) handsets carried by individual miners to the PBX at the headquarters site, with PSTN (Public Switched Telephone Network) access via the PBX. We have demonstrated clear real time VOIP multicast (push to talk) communications over a 50+ hop string of pearls wireless mesh chain in a coal mine. 150 mesh nodes were employed in the test, with multiple pathways each with nodes in a string of pearls chain. VOIP multicast traffic was successfully tested over 50 hops, end to end. A miner location and tracking system based on Wi-Fi is also supported over the Meshdynamics wireless infrastructure. Along with the two-way voice communications, this helps to fulfill the MINER Act requirements. In addition, an IP-based video camera is being used to monitor remotely a key junction of the belt system that is crucial to mine productivity. The key to these successful demonstrations is the ability to provide very high performance for high-quality video and voice over a large number of hops. While most Wi-Fi mesh solutions would fail after a handful of hops, Meshdynamics' patented and patent-pending solutions begin by providing two backhaul radios to each node. To overcome the problems of congestion and contention one radio is used to create a link to its upstream (nearer the wired source or "root") node. Another radio creates a link downstream to the next neighbor node. 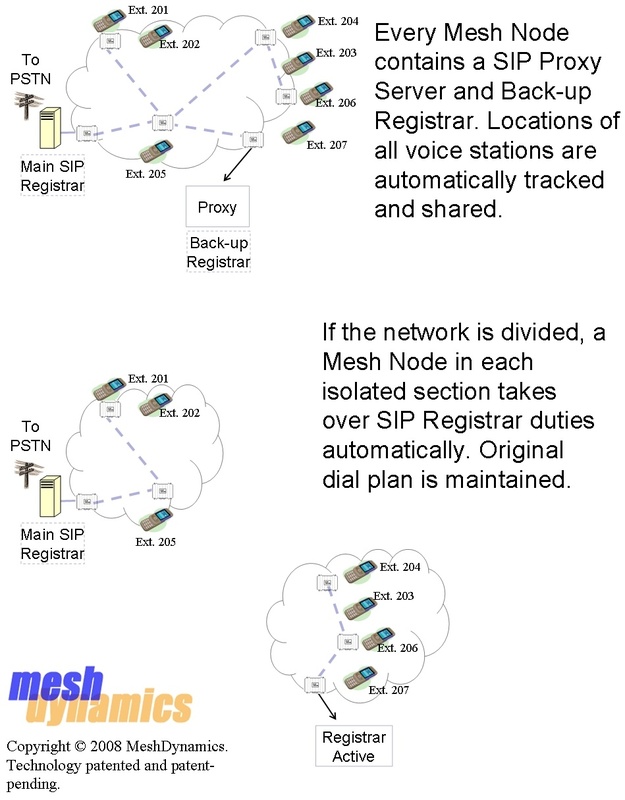 Meshdynamics' third generation patented mesh networking software creates an RF-aware "radio robot" in each MD4000 node. This distributed dynamic radio intelligence constantly monitors the surrounding radio environment. The node locates adjacent nodes in the network as they are added. Based on this continual scanning of the environment, the Meshdynamics nodes form a network in an independent, but coordinated fashion, with relationships based on highest performance, interference rejection, and optimal re-use of channel assignments for maximal network bandwidth. In the remote mining environment, this continuously and automatically adapts the MD4000 network to the changing configuration of the mine and locations of the mining machinery. Meshdynamics provides this networking power in a compact, robust enclosure requiring little room in the cramped underground environment. Low power draw and available battery power solutions permit use in harsh environments and provide back-up functionality in case of power failure or other incidents. Our dynamic radio intelligence allows nodes to be installed and supported easily, without costly site surveys and pre-engineering. Meshdynamics products also include intrinsically safe technologies for deployment in severe environments, as well as specialized support for voice-over-IP and other real-time networking requirements. 6. MD4000 Configuration Options Overview of configuration options including 3.3VDC explosion proof enclosures. 7. Frequently asked Questions On Antenna selection, GPS, Mobility extensions, Hazard proof enclosures. Hundreds of feet underground, nearly a mile away from the mouth of the mine, a miner realizes he needs to repair a key piece of equipment. Summoning an engineer used to mean a long walk back through the mine or a long wait for the man trip, a motorized shuttle vehicle. While the miner is walking or waiting, no co dug, so these interruptions add up quickly in lost production. But now, with the push of a button on a wireless VoIP handset, miners can request that engineering resources be dispatched to a location without going anywhere. If the VoIP system is connected to the public phone network, staff in the mine may be able to get service assistance from equipment manufacturers while at the working face. In a few minutes, the miner is safely and productively back to work. Multiply this scenario by dozens or hundreds of times per week in a large mine, and there is an obvious, immediate positive impact to the bottom line. But how did this step- and timesaving exchange take place nearly a mile down the mineshaft? Traditional cellular signals don�t propagate through rock, and there�s no time for laying wire phone lines Compact wireless mesh node and antennas mounted on a support column are designed for harsh environments. Miners Give a Nod to Nodes New mesh networking technology boosts worker safety and productivity and fulfills new federal requirements. The answer is third-generation wireless mesh technology based on the Wi-Fi 802.11 protocol. A series of multi-radio enclosures, called wireless mesh nodes, propagate the signal down the length of the mineshaft and wirelessly connect miners working or traveling nearby. The nodes may be placed along entries, travel ways, beltways or in airway intakes and returns to wirelessly link miners at the working face to the rest of the mine, as well as to the office and managers outside the mine. Improving Safety and Response Besides the time-saving productivity boost, the wireless mesh nodes also provide infrastructure that delivers lifesaving miner location and communications capability in case of an accident or disaster. Preserving the safety of underground mine personnel has been an important focus of government and industry. In the aftermath of the Sago mine disaster, a coal mine explosion in Sago, W. Va., in January 2006, the federal government set in place a timetable for underground coal-mining operations to upgrade procedures, equipment and technology with the passage of the Mine Improvement and New Emergency Response (MINER) Act in 2006. Major elements of the MINER Act require a wireless twoway medium of communications and tracking of individuals by 2009. A wireless communications system that provides two-way communications between underground and surface personnel and an electronic tracking system that allows surface personnel to independently determine the location of anyone trapped underground is key to meeting the requirements. New Wi- Fi wireless mesh technology delivers high performance and reliability at low cost over long distances in underground coal mines in numerous pilot and production mine networks, because it allows for reliable two-way VoIP communications and Wi-Fi location tracking. Underground Coal Mines Underground coal mines, both �long wall� and �room and pillar,� are challenging settings for wireless communications. There are often multiple adjacent entries (tunnels) into the mine. At the least, the network must provide coverage in the belt entry, the main travel way, primary escape route and for the working unit at the mine face. Another challenging characteristic is that the mine is constantly changing: The working unit progresses forward everyday, and therefore the supporting infrastructure must move with the unit. Any communications systems must be easily deployable, configurable and resilient. Because of the vehicle and human traffic and hazards such as moisture, rock fall and vibration, a compact and robust physical device is required. The safety and communications mission demands the ability to work from battery power and for isolated portions of the network to continue operation if disconnected by an incident. Because distances in the tunnels can be quite long, the mining environment poses unique challenges for real-time data over many hops. A recent successful installation in a working room-and-pillar underground coal mine required long-distance connectivity for voice, location tracking and video process monitoring. Because the headquarters and processing plant is 3.5 miles from the main lateral entry to the mine, multiple hops were needed both outside and inside the mine. In a number of locations within the mine itself, wireless mesh nodes were secured to the roof bolt or supporting timbers and powered by a battery backup system. Surface Mining Applications Outdoor, above ground mining sites also require wireless voice, data and video communications. There is an increasing need for up-to-the minute status on operations, equipment and personnel, as well as a strong move toward mine automation. But because an open-pit mine is a constantly changing landscape, it�s necessary for any network deployment to be simple to deploy and re deploy. The wireless mesh nodes act similar to �radio robots� to locate one another and quickly establish a network without operator intervention. The nodes may also be in motion relative to one another and to fixed elements of the network, yet remain constantly connected. It�s critical for mining enterprises to monitor the productivity of a haulage fleet and report that information back to local and corporate management. Extending the network into the mine also extends the private telephone network into the pit � vital for remote locations that are often without cellular service � and at much lower cost than satellite telephony. In a recent installation in an open pit mine, a fixed wireless mesh node was placed at the administrative office, and several re-locatable wireless mesh nodes with solar power were deployed on trailers throughout the active area of the mine. Mobile mesh nodes on haulage trucks and loaders provided communications for the automated mining application in use on the vehicles. Because of third generation radio intelligence, the nodes maintain communications throughout the active area of the mine and can be easily relocated. Optional GPS capability allows managers to instantly locate any of the wireless mesh nodes and its host vehicle on a map view of the mine. Additional safety voice and video applications may also easily be deployed over the wireless mesh infrastructure. The wireless mesh technology provides the high performance, low delay and jitter, and mobility required for reliable communications in demanding mining environments. Best of all, networks deployed to increase miner safety may also boost productivity and vice-versa. As mining becomes more technical and automated, third generation wireless mesh keeps the mining enterprise seamlessly connected from working face to office. The nodes wirelessly link miners at the working face to the rest of the mine, as well as to the office and managers outside the mine.